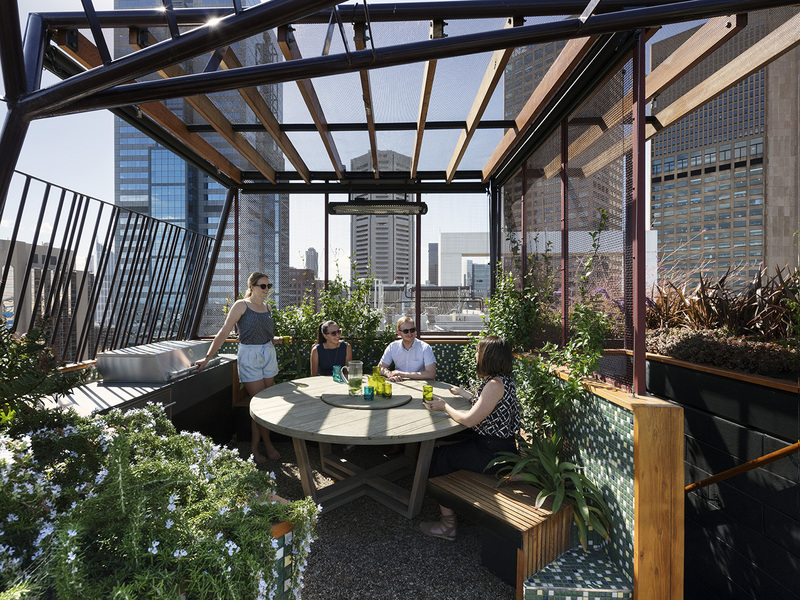 Phoenix Rooftop is a green refuge in the unlikeliest of places - 30-stories high, on an exposed, yet spectacular site in the centre of Melbourne. This sky-scraping garden means two down-sizers don't need to sacrifice the joy and health benefits of a 'backyard' as they transition from suburbs to city. The project provides the same functional requirements you would find in an average suburban garden, demonstrating similar spaces can be incorporated into dense urban environments. The site is broken into three distinct, yet connected zones: standing zone, sitting zone, eating zone. Raised garden beds filled with fragrant and flowering plants act as a wind break, a balustrade, and help to delineate and enclose each of these zones. An arbour straddles the garden, shading, shielding and protecting the occupants. The arbour is designed to respond to each zone's relative need for privacy, sunlight, and protection from the wind and rain, using a combination of creepers and timber battens. Dealing with the unique challenges of an exposed and overlooked site, atop a building never designed to support the load of a green roof, Phoenix Rooftop demonstrates the potential of rooftop gardens, even in the most extreme environments and urban contexts. The Sustainability Awards is Australia’s longest running and most prestigious awards program dedicated to acknowledging and celebrating excellence in sustainable design and architecture. Nominations received are shortlisted and then winners for each category are announced at a five-star Gala evening hosted this year at the Star, Sydney on 11 October 2018. The daytime event Sustainability Live is a CPD-endorsed education event where industry experts present a range of topics to educate, inform and ignite learning.